Ari Ramezani (left) and Jim Murphy, in their Phone Power offices before Ramezani passed away. On New Year's Eve 2012, Jim Murphy sat in a Los Angeles hospital room at the bedside of his closest friend and business partner Ari Ramezani, who was fighting an aggressive stomach cancer. Not only was he devastated at the prospect of losing his friend, but they had done very little to prepare their company, a voice-over-IP phone provider called Phone Power, for the situation. 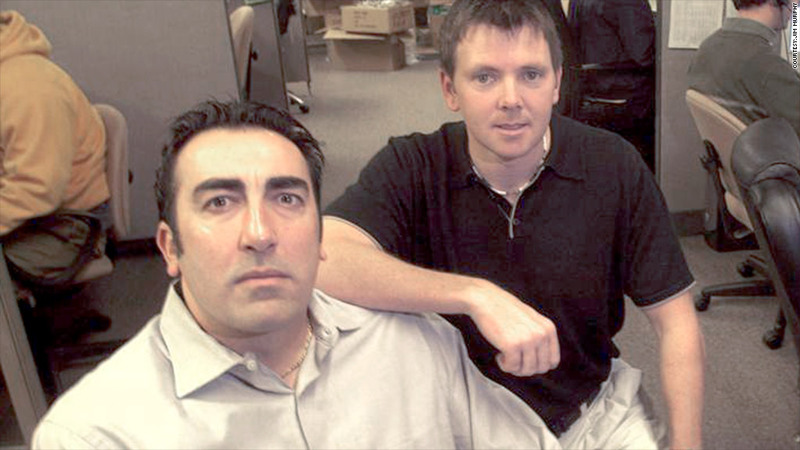 The two men, both in their early 40s, had been inseparable since college, and over the past two decades had built four businesses together, selling one, a DSL company, for $12 million in 2005. They vacationed together in Las Vegas and Mexico, stood in each other's weddings and bickered at work like a married couple. "I spent as much time with him as my wife," says Murphy. Phone Power was growing quickly, hitting $16 million in sales in six years. It had just acquired a Boston company called Broadvoice, and they were integrating the two sets of employees and operations. Ramezani had been noticeably absent for months leading up to his cancer diagnosis in June 2012. After that, he never returned to work. "The overall mood had really changed at the company," says Sam Ghahremanpour, Ramezani's younger cousin who was hired to help with the acquisition. It was so sudden --- and the partners were so young -- they hadn't taken any steps to protect their firm. There was no "key man" insurance policy that paid the company in case of a cofounder's death. They didn't have a succession plan. And they had a $4 million loan, which the bank could recall if a cofounder left the company -- which included one of them dying. In the weeks leading up to Ramezani's death, Murphy pushed to get the business in order. He successfully convinced bankers not to call the loan. He set up a board of directors to protect the interests of Ramezani's family, and he created an operating agreement for any major decisions. And, aware of his own mortality, Murphy even took out a key man policy on himself. In the hospital on New Year's Eve, Murphy promised his friend that he would take care of his wife and three children, all under the age of 13. Less than two weeks later, Ramezani was gone. When Murphy returned to work, he buried himself in his responsibilities. But inside, his confidence buckled. "I felt like I couldn't fail," he says. For two decades, Murphy had always had a partner to handle tough times. The two started their first business, a cell phone and pager firm, as roommates in college. They learned to be entrepreneurs together -- signing their first lease and interviewing their first employees. While Murphy would focus on the profit and loss, Ramezani shot from the hip, arguing to get customers now and worry about profits later. Ramezani was a big idea generator, while Murphy was skilled at the logistics. "He pushed me beyond my comfort zone," he says. Related: Who will run your business when you're not around? Murphy eventually hired a therapist, and he rallied Phone Power's employees to take over Ramezani's duties. By March, Murphy decided it was time for Ghahremanpour, who had become chief operating officer, to move into Ramezani's office, which had been untouched for nine months. Inside were papers from May 2012, an empty Gatorade bottle and Ramezani's scratched handwriting on the white board. "It was like a time warp; it was very surreal," Murphy says. As he regained his confidence, Murphy became more motivated to build on the duo's success. He and Ghahremanpour grew sales in 2013 to $18 million, and Ghahremanpour has forged ahead with plans to capture new markets, such as small business customers and immigrants. "I've tried to take Ari's approach to always looking for ways to improve the business," says Ghahremanpour. His business sensibility has lived on. Now, when the executive team can't agree on a tough decision, they ask, "WWAD? What would Ari do?"